In the mid- to late-1800s, four out of every five North Carolina workers was employed in agriculture. Although agriculture and agricultural products remain vital to the state’s economy, agricultural employment declined steadily through the late 20th century. 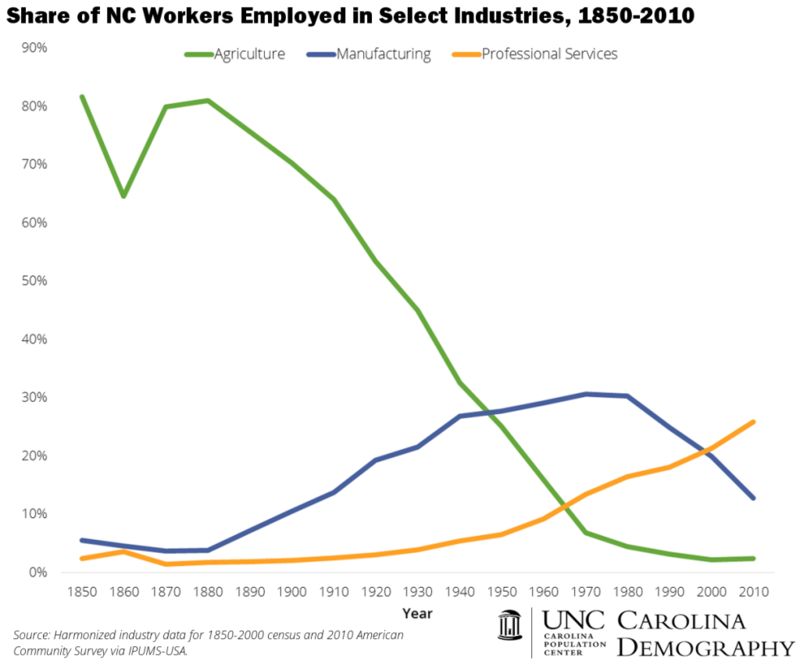 At the same time, manufacturing emerged as a dominant employment sector, officially surpassing agriculture as the leading employment sector in North Carolina in 1950. Manufacturing employment in the state was at its highest between 1970 and 1980, and then declined substantially. In the 2000 Census, professional services–a category that includes educational, engineering, legal, and medical services–surpassed manufacturing in share of total employment. This entry was posted in Carolina Economic Data and tagged agriculture, economy, employment, industry, manufacturing, professional services. Bookmark the permalink.